Yesterday evening I was privileged to attend the opening Mass of the 26th World Youth Day in the Plaza de Cibeles in Madrid with hundreds of thousands of other young Catholics. Notting Hill Carnival could not compete with the vivacity and excitement demonstrated last night by the Church’s young, despite the intense heat and bustle. In an atmosphere of potential chaos, tempered by pure devotion, Madrid witnessed scenes that will forever remain in its memory. In the middle of London’s equivalent of the Strand both young and old packed the streets, dancing, singing, chanting and, moments later, kneeling in humble reverence to adore God and prepare for their hero, Pope Benedict XVI. The opening Mass was in memory of Blessed John Paul II and there can be no doubt that this pope is ingrained in the hearts of the faithful. Video clips of John Paul II on big screens around the centre were greeted with shouts, cheers and cries. He was, according to Cardinal Antonio Rouco Varela of Madrid, the “pope of the young people” and “young people are the hope and future of the entire Church”. The Archbishop of Madrid dedicated much of his homily to describing the late pope’s life, which was marked by the challenges and trials confronted by this extraordinary man who “lived the truth that God is with us”. Speaking directly to the youth present, the archbishop said: “You are the generation of Pope Benedict XVI.” His words were greeted by eager applause. It’s clear that Cardinal Varela grasps the political significance of World Youth Day in a Catholic country governed by an administration which shows minimal sympathy for the Church and its values. Throughout his homily the archbishop shrewdly asserted that Spain could not be understood without its Catholic heritage and that Catholic tradition forms the character of the nation. The tone of the archbishop’s address is surely an indicator that World Youth Day arrives at an opportune time for the Spanish Church and will boost its morale. But of course this is primarily a pastoral occasion and the archbishop emphasised to pilgrims that on their journey God would find them. He called on them to accept the challenge of the New Evangelisation. He told them that they would find God in the Eucharist, among the poor and in the Sacrament of Reconciliation. Given the courage and wisdom that Benedict XVI showed during his visit to Britain, I doubt the Pope will waste any time in using the incredible demonstration of faith by the young to remind the current government that the Church is integral to the character and values of Spanish democracy. 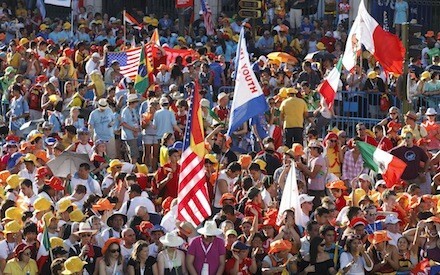 The opening Mass has set the tone for Pope Benedict’s arrival on Thursday. This week will be instrumental in reinforcing Spain’s national character as it stands at a crossroads in its history.